UMW Toyota Motors Sdn Bhd, a unit of UMW Holdings Bhd, launched the new locally assembled Toyota Camry Hybrid on Monday. Minister of International Trade and Industry Datuk Sri Mustapa Mohamed performed the Toyota Camry Hybrid CKD line-off ceremony. The group also launched a new assembly line at its plant in Shah Alam, which will be operated and managed by Assembly Services Sdn Bhd (ASSB). UMW Toyota chairman Tan Sri Asmat Kamaludin said the group expects to roll out some 7,000 units of the all-new Toyota Camry Hybrid over the next nine months. “Between 2010 and 2015, UMW Toyota has so far invested close to RM180 million to assemble Toyota Camry CKD (completely knocked down),” he said at the launch. Earlier, Mustapa said Toyota first began local assembly of its vehicles in 1968. Asmat said UMW Toyota had sold 116,000 units of Toyota Camry since it was first introduced in the country in 1994. 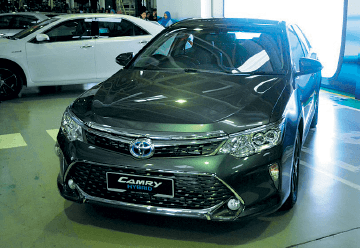 He said the all-new Toyota Camry Hybrid CKD was ASSB’s first locally assembled hybrid vehicle and the production of the Camry Hybrid CKD proves the company’s commitment to launch a model that will meet customers’ expectations. The Toyota Camry Hybrid in Thailand has a 2.5-litre VVTi four-cylinder petrol engine that combines with a 2AR-FXE electric motor which develops a combined horsepower of 205. The specifications for the local model are expected to be similar to the Thai model. The semi-electric vehicle is expected to be priced under the RM200,000 mark. Also present at the ceremony were Japan’s ambassador to Malaysia Dr Makio Miyagawa, UMW Toyota deputy chairman Akio Takeyama, UMW Holdings president and group chief executive officer Datuk Syed Hisham Syed Wazir, UMW Toyota president Datuk Ismet Suki and Toyota Motor Asia-Pacific senior vice-president Hao Quoc Tien. This article first appeared in The Edge Financial Daily, on March 26, 2015.